Both Democrats and some Republicans insist they want to extend the payroll tax cut, but the only action in Congress today amounted to political theater. Most lawmakers have left town for the holidays, though they could quickly reconvene to take an important vote. The House only held a brief, symbolic meeting today, but before they could turn out the lights in the House chamber, two Democratic leaders protested the House GOP's intransigence. 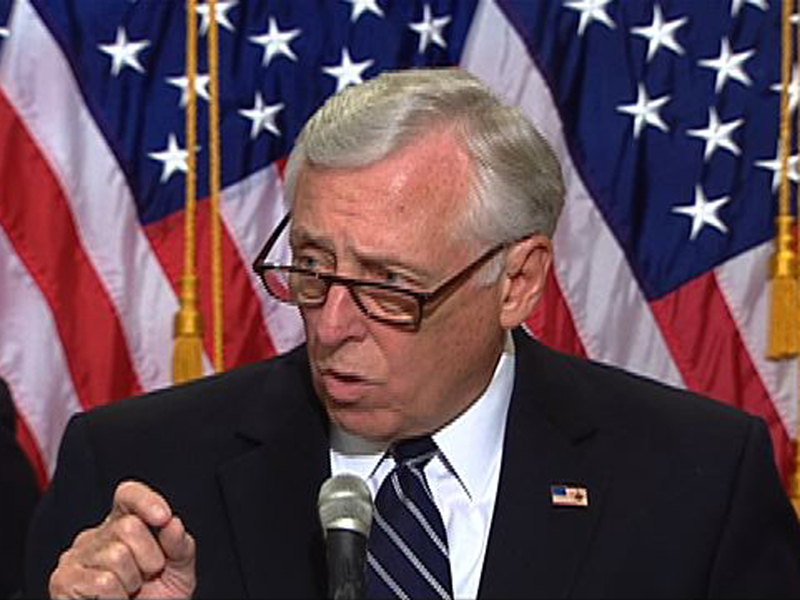 "Mr. Speaker, I would like to ask for unanimous consent that we bring up the bill to extend the tax cut to 160 million Americans," House Democratic Whip Steny Hoyer yelled on the House floor. "As you walk off the floor, Mr. Speaker, you're walking away, just as so many Republicans have walked away, from middle-class tax payers, the unemployed, and very frankly, as well from those who will be seeking medical assistance from their doctors -- 48 million senior citizens." Hoyer was calling for a vote on the Senate-passed bill to extend the payroll tax cut for two months. After he finished his remarks, he ceded the floor to Democratic Rep. Chris Van Hollen. However, Republican Rep. Michael Fitzpatrick, who was presiding over the very-short session as acting speaker, walked out as Hoyer and Van Hollen were still speaking. Republican House leaders have avoided voting directly on the Senate bill, which would have put their members in a tough spot -- either voting against a popular payroll tax cut or relenting to the Senate on the two-month extension. House Republicans charge that a two-month extension is irresponsible and that Congress should immediately pass a full, one-year extension. The Senate chose to pass the two-month extension to give Congress more time to work out its differences on the matter, which largely come down to how to pay for the tax cut. If they payroll tax cut is not extended by the end of the month, about 160 million Americans would see their payroll tax for Social Security revert to 6.2 percent from the 4.2 percent it was lowered to a year ago. Failure to act would also result in cuts to Medicare doctors' fees and a lapse in jobless benefits. After their symbolic attempt to move for a vote on the House floor, Hoyer and Van Hollen held a press conference, where Hoyer said, "I regret that the Republicans can say that they are here to work, while we are on the floor to do our work and they walked out." House Republicans have called for a "conference committee" -- a small group of lawmakers from both the Senate and the House -- to work out the two chambers' differences. Hoyer pointed out that five of the conferees that House Speaker John Boehner appointed have said at one point or another that they are opposed to a full, one-year payroll tax cut extension. "And, in fact, [they] have made comments similar to the speaker's that the middle class tax cut is a gimmick," Hoyer said. "Well, the middle class doesn't believe that, and working men and women in this country don't believe that."